Known as one of Britain's top topiary sites, Avebury Manor in Wiltshire was built on the site of a 12th century Benedictine Priory. 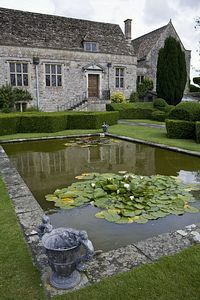 The present manor was built in the early 16th century and is a truly lovely place to visit, both for the Manor and its surrounding gardens. 1696-1742, also had much remodeling done. 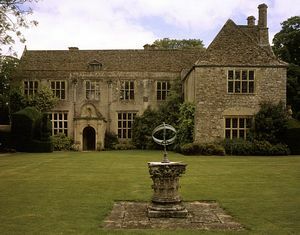 The Manor now ranges from one to three storeys in places with a fine collection of stone-mullioned and transomed windows with a pedimented entrance. The Manor remains privately occupied but some areas are open to the public including rooms believed to have been Alexander Keiller's bedroom and dressing room. Keiller was the heir to the Scottish marmalade fortune and became a leading archaeologist. He was known to have worked extensively on the restoration and protection of the Avebury Stone Circle nearby in the late 1930s. Other beautiful rooms to see are the Chinese Room and the Cavalier Room. During the tour, look up and see the magnificently carved beasts which decorate the mouldings and the intricately designed ceilings in these rooms. The panelled parlour has an angled fireplace and traditional chamfered beams below the ceiling. The Great Parlour has an impressive stone fireplace which has seen plenty of smoke since it was installed around 1600. The fine Elizabethan bedroom has an arabesque frieze and a carved wood overmantel. to enjoy as Avebury Manor itself and guided tours are also available. The gardens were completely redesigned in the early 20th century by the resident Jenner family in the layout which still survives today. 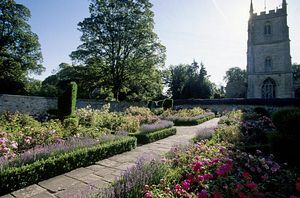 Beyond the lavender-lined lawns are the formal gardens, divided neatly by clipped box hedges which divide the garden into open-air rooms. Skillful topiary takes the place of ornaments and the beautiful plantings and sweet scents make this a tranquil place to relax. The Edwardian gardens are well protected and warmed by the medieval walls and have raised paths, a rose garden and an orchard. 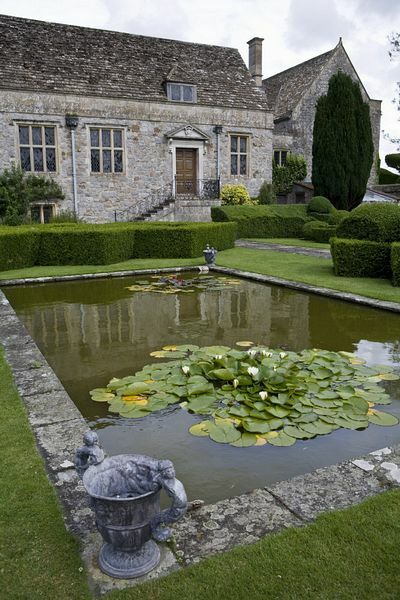 Avebury Manor Gardens were in fact the inspiration of Vita Sackville-West, who often visited in the 1920s. She went on to create her own garden paradise at Sissinghurst. There is a choice of options for refreshments during your visit to Avebury Manor. Enjoy a picnic in this quintessential English setting or book high tea at the Manor along with an interpretive tour of the house. The on-site Circle Restaurant also provides Wessex artisan food and drinks and a choice of vegetarian options. Stagecoach in Swindon 49 Swindon-Trowbridge; Wiltshire and Dorset 96 Swindon-Pewsey. Both pass close Swindon. NCN4 and 45 View local cycle routes on the National Cycle Network website. 6 miles west of Marlborough, 1 mile north of the Bath road (A4) on A4361 and B4003. Pewsey 10 miles; Swindon 11 miles.